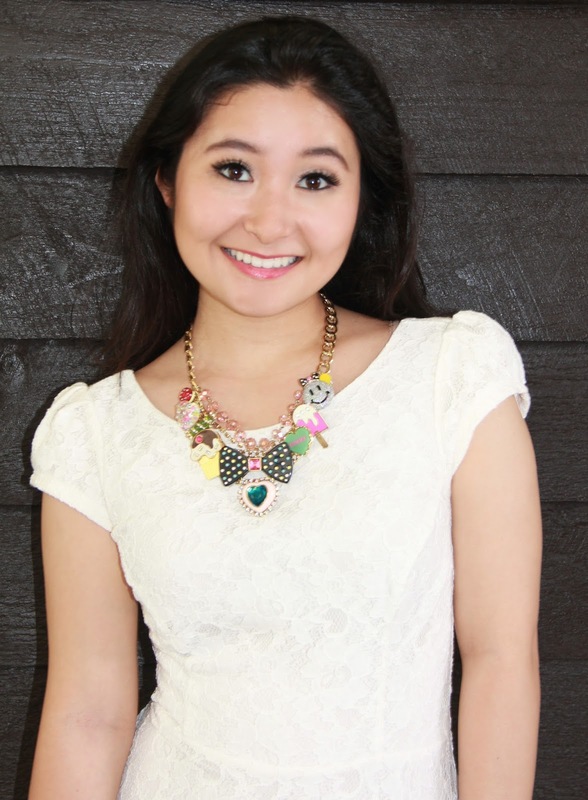 I chose to feature this Betsey Johnson necklace because it was one of my most challenging statement necklaces to style. Although this necklace is not one of my go-to statement pieces, I wanted to show you that even if it isn't as versatile as a gold or silver chain necklace, you can make any statement necklace look casual or dressy depending on the clothes you wear. For my first outfit, I paired the necklace with a simple white lace dress and gold heels. Pairing a statement necklace with a simple dress is an easy way to make the outfit look more dressy. My second outfit is a little more casual. I wore a bright pink crop top with a denim skater skirt, and gold sandals. I love this outfit because the necklace makes this outfit sweet and fun. I would definitely wear this ensemble out to lunch or shopping with friends! In this last photo, I wanted to show how you can pair a statement necklace with just a basic white t-shirt and jeans. Even on days where you don't feel like dressing up, you can still rock a statement necklace and people will think that you spent more time on your outfit than you really did. So, don't be afraid to wear a bold necklace. Try pairing your statement necklaces with the clothes in your closet and see how many outfits you can come up with! Remember that fashion is all about expressing yourself, so have fun with it! Sending you lots of love from my heart to yours!